I usually begin with dark lines when I begin my compositions with ink. Today I began with red. I applied yellow adjacent to the red lines. Starting my design with these colors was unsettling, to my surprise. Perhaps this is a reaction to my standard practice of late: using bold, dark lines. At any rate, discomfort is a good place to start, if one wishes to try new things. My strategy was to make the forms outlined in red contrast with the background. I started on the upper portion with a bright green, which didn’t work at all. Along the border of yellow, I used purple, its compliment again, to bring out contrast. I darkened most of the green and added a blue-to-red blend between the two yellow fields, succumbing to the familiar. 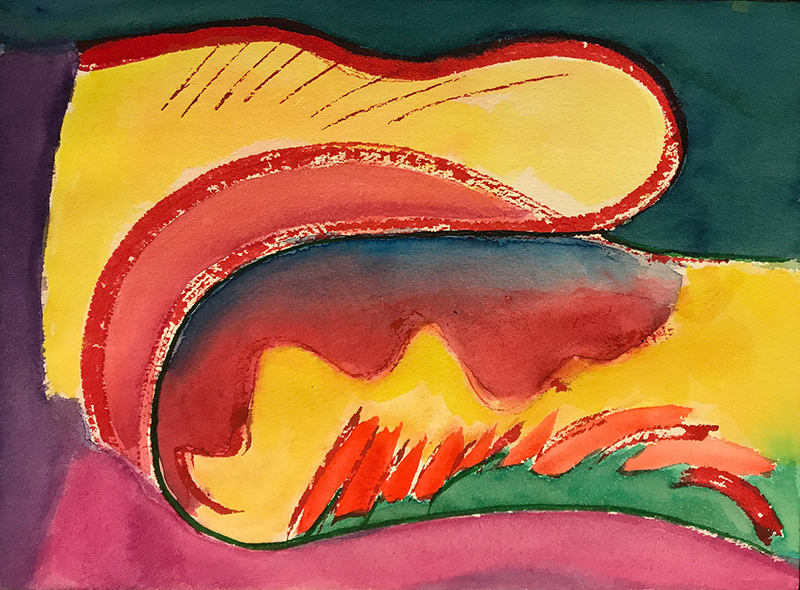 This entry was posted in Personal Stories and tagged artistic process, comfort zone, creative process, creativity, discomfort, ink lines, painting, visual arts, watercolor. Bookmark the permalink. Me too. Breathing fire, too. Yes. Red and yellow are on the hot side. I noticed that as well – after I finished.